It has been a long time since my last post, but a number of unexpected things have happened that have kept me both from blogging and from artwork. However, I am back again, and I am here to share with you something that I’ve kept a secret since I first thought up the idea back around March of this year. My parents celebrated their 35th anniversary on September 13th. Since it was a milestone year for them, I wanted to make some kind of artwork for them that would be meaningful. 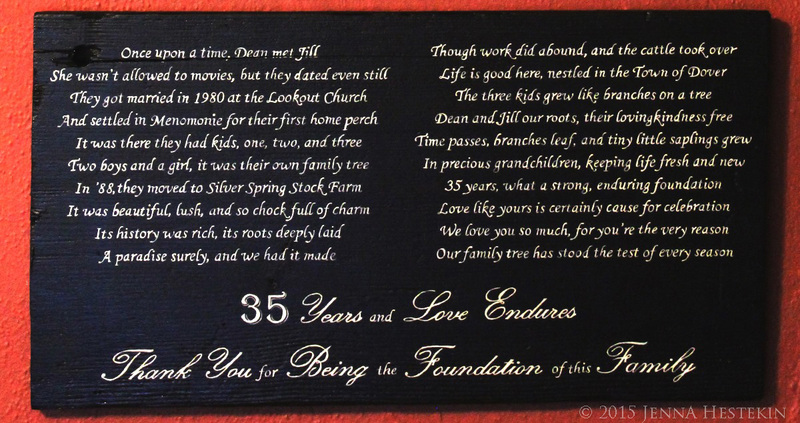 I came across several beautiful poems that likened parents to the roots of a tree, the strong, steady foundation that holds everything together. I liked that idea very much. It inspired me to start working on a poem of my own, personalized to mean as much to my mom and dad as possible. I had to work in complete, delicious, secrecy. They are so involved in what I create and what I’m up to in my studio, so I had to go to great effort to keep this a secret. It all started when I went to Junk Bonanza last April. I went with my mom, but I had a secret agenda. I wanted to find something with a 35 on it, or even letters to spell Happy Anniversary. I knew it would be tricky to buy it when she was right there with me, but I was determined. I came across a booth that had many small metal numbered tags, post office tags, cattle tags, you name it. Under the guise of searching for “junk supplies for my sculptures”, I began to look quite thoroughly. Luckily for me, my mom said she was going to move on to the next booth while I looked. And then I found it! 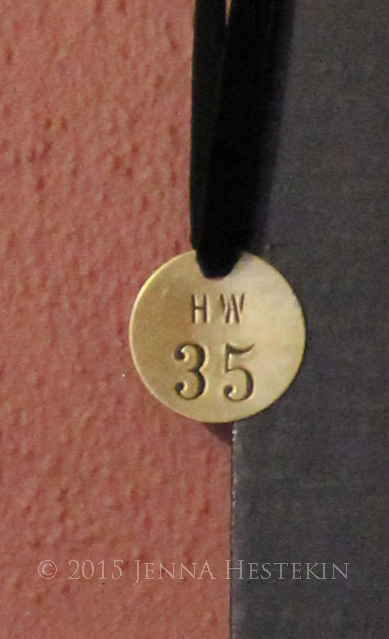 A metal tag with a 35 on it. And not only that, but above the 35 were the two letters H and W. How perfect could it be? H for Husband, W for Wife, and a 35. Awesome! Just so my mom wouldn’t wonder what I had bought, I purchased a few other little items so she wouldn’t single out that one tag. Early in the summer, as soon as the leaves were full on the trees, I went for camera walks, getting pictures of our trees to go with some sort of tree poem. The tree that has the most sentimentality for our family is the enormous maple tree that is in our front yard, towering over our house. It’s been a part of our lives for a long time. My dad remembers stringing up a tire swing in it as a kid, and my brothers and I used to play in a tire swing from that very tree, and now, my parents’ grandkids have two tire swings hanging in that tree, too. It’s a trusty old tree, complete with wooden board “steps” nailed onto it from my childhood. As you can imagine, I decided that this was the tree to draw. 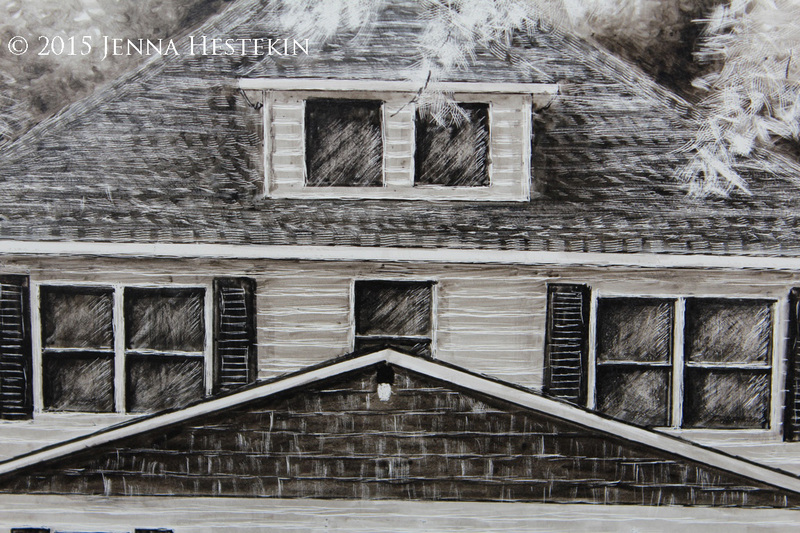 As I photographed it, I included the house, which was build in 1926. My brothers and I grew up in it, and my dad and his brothers and sisters, and even his dad and his brother. It’s got so much history and so many memories for us all. I couldn’t draw that tree without this beloved house nestled beneath it, so my plans were made. I started the drawing on June 17th. The drawing is clayboard, just the second clayboard I’ve done. It’s a big drawing, as I wanted it to be dramatic for Mom and Dad’s wall. Keeping it very secret, I worked on it only when they were nowhere near, and I had to cleverly hide the drawing, the supplies, and all other evidence that I was working on anything in my studio. Meanwhile, I spent several nights up late in bed, writing and rewriting the poem I wanted to give to them with the drawing. I found some amazing tips on how to paint letters neatly on a wooden board, and I got started on that. I mixed a couple of ideas I found online for sign-painting to get the result I wanted. I painted the board black (just an old board that was in the basement…I sanded it fairly smooth first), and then printed the poem on regular printer paper in the font I liked. I then took a white charcoal pencil and colored the backs of the papers generously. After checking, re-checking, re-checking, and re-checking the alignment of the papers on the board (it took 4 sheets of paper to get the lettering big enough to fill the board), I taped them in place. 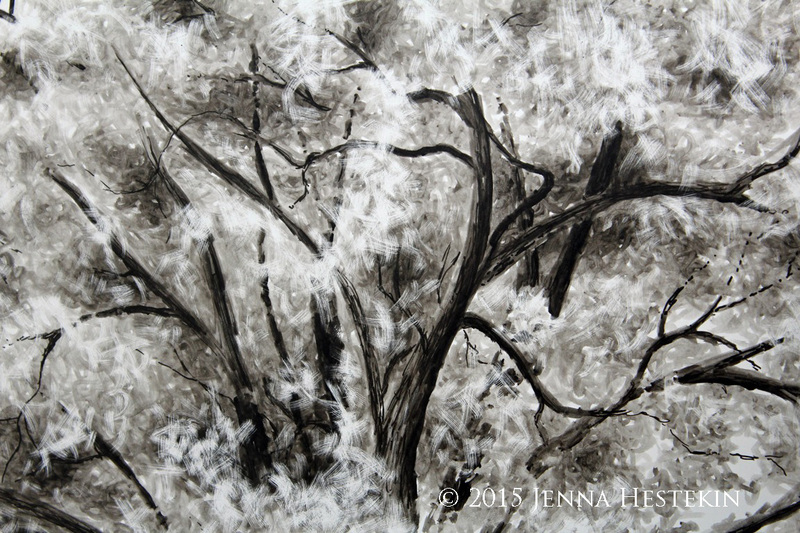 I then took a ball point pen and wrote over the words firmly, causing the white charcoal to transfer onto the wood. When I lifted the papers, I was so surprised by how neat it looked! I then took a cream-colored acrylic paint, diluted it quite a bit, and painted the letters using mostly a 00 paint brush. It took quite some time, but I was really pleased with the result! Ah, but the wooden sign didn’t take long at all compared to the drawing. 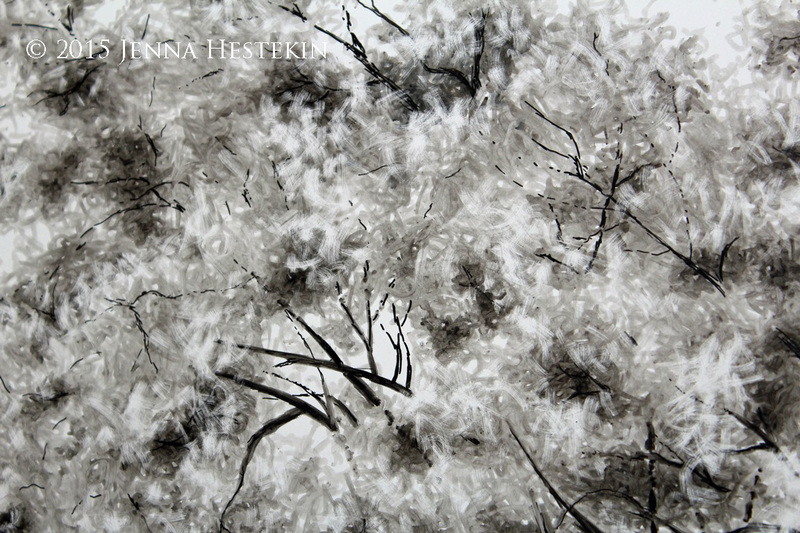 A clayboard is essentially an un-inked scratchboard…it is simply white clay on a Masonite board. You add the ink (or paint or whatever else you’d like) yourself as you wish. 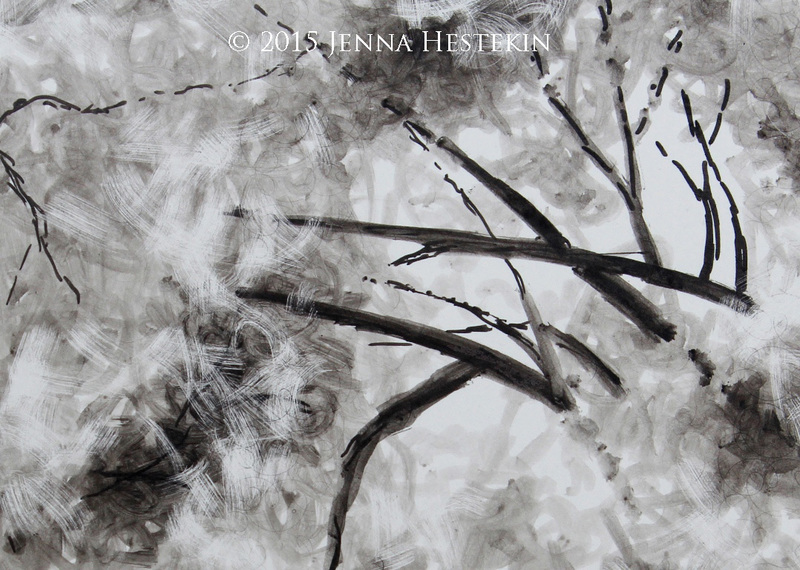 I used Faber-Castell Pitt Artist Pens for this project, using mostly brush tip for the application of inks. Anything on the board that is not white had to be inked over first. 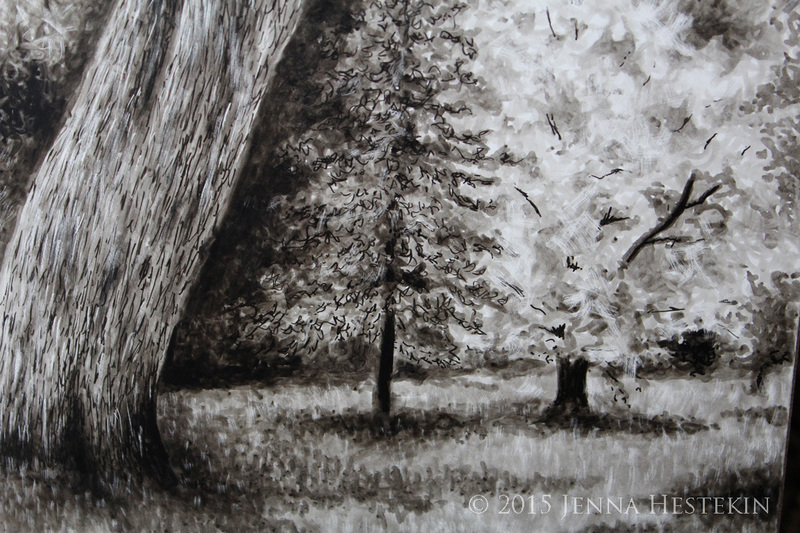 I used a variety of grays and blacks to get the desired values in this drawing. 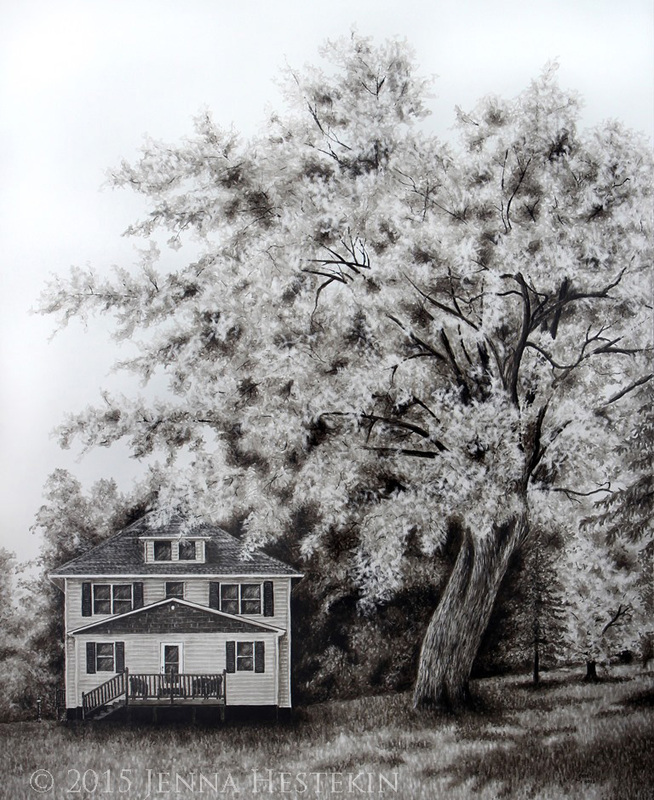 – The clayboard drawing measures 16 x 20 inches in size. It is made with a set of Faber-Castell Pitt Artist Pens (the Manga set of 8), some other very fine pens for detail and texture, a couple of different X-Acto knives, a fiberglass brush, some other scratchboard tools, and steel wool to remove smudges or marks in larger areas. – The wooden sign is made with just an old board that was in the basement (note the hole in the upper left corner), sanded, and painted with black acrylic paint. White charcoal, printer paper, and tape for the lettering, and cream-colored acrylic paint for the poem. I sealed the board with a satin varnish. 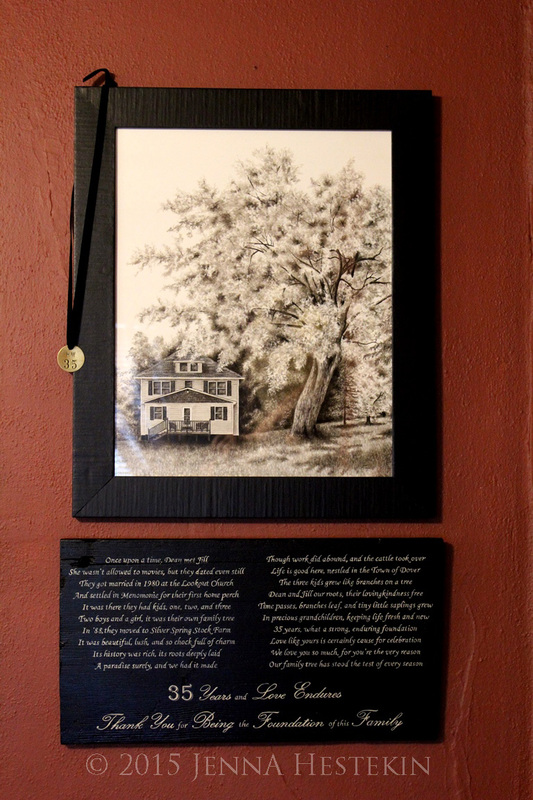 And the finished, framed, and displayed artwork as it looks on the wall. Happy Anniversary, Mom and Dad. I love you both so much! Well, I’ve taken a little break from blogging since my art show back on the 7th and 8th of August. It was a great show, and I enjoyed it very much! I thought I’d share some photos from my tent display. This is just my 3rd art show so far, but I hope to do more of them in the future. They are a lot of work, but also such great fun! I met some wonderful people, both fellow artists with their own work at the show, and the visitors who came to explore the art fair. 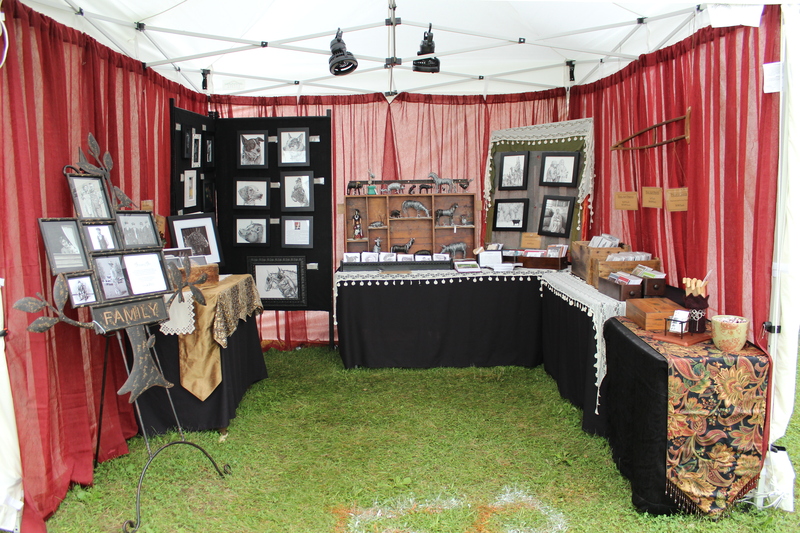 If you happened to attend Ashley for the Arts (located in Arcadia, WI) and visited my tent, I want to say thank you for looking at my work! I hope you enjoyed what I do, and please remember that I would be very happy to draw your old family snapshots by offering Ancestry Art, or also would be happy to draw your beloved pet. Please don’t hesitate to contact me at indee.artist.jen88@hotmail.com if you’re interested! 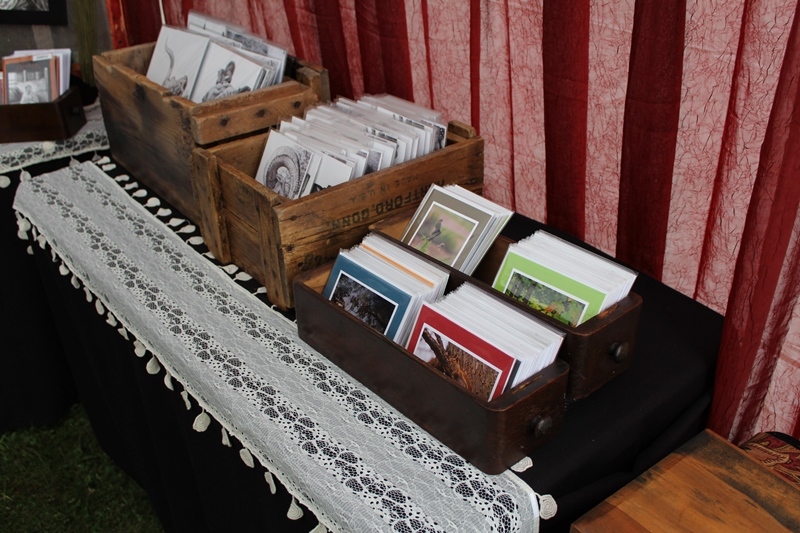 It was pretty windy as we set up on Friday, but it calmed down, and the weather was perfect after that for both days. 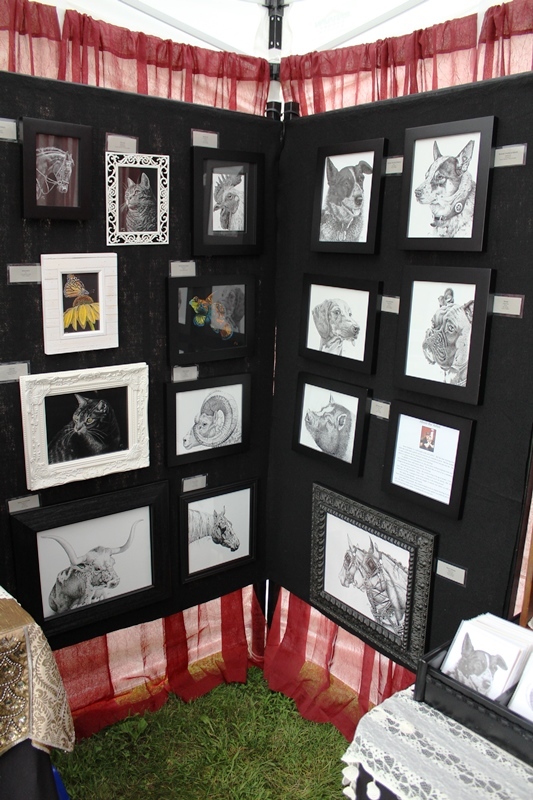 This was my first two-day show, so there were some new challenges faced, but it was a good experience. Since my first art show, I’ve changed a few things. I invested in some pretty curtains to give my tent more personality and character, and also to make it feel like a store instead of just a tent. 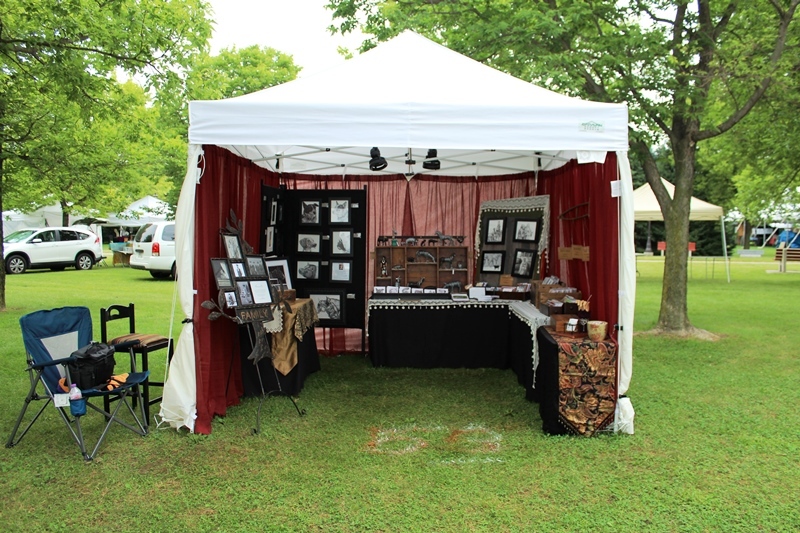 Some displays are new since my first show, such as my Christmas art and card display, my Ancestry Art display, as well as some new shelves and boxes for my artwork. 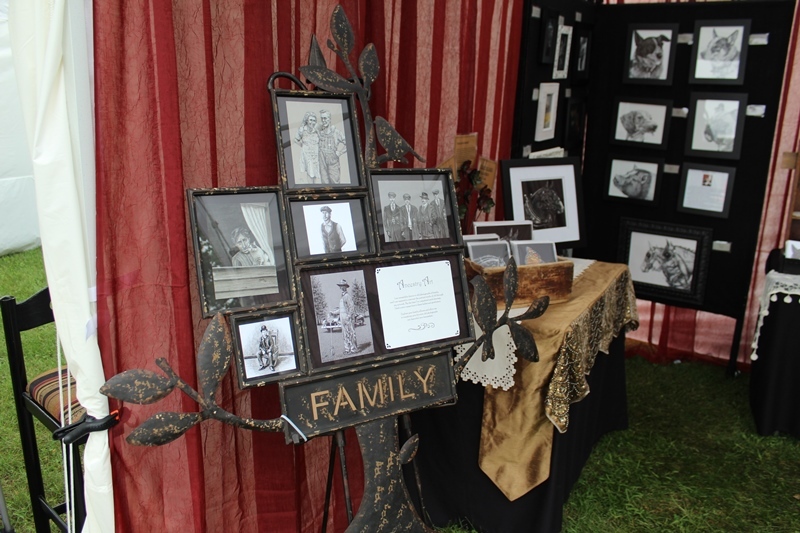 I really wanted a timelessness in my display, so many of the items are reclaimed and old. Since so many of my drawings are animals, especially farm animals, I like keeping my own family farm’s heritage here with some of the wood boxes that are from around my home. I like to keep things cozy, so that people feel comfortable coming and going. The two black things up at the top inside the tent are fans, and they were so worth the investment! They feel great on a hot day! Click to view this larger. This is my Ancestry Art display. I am happy to say people seemed to respond to it well. 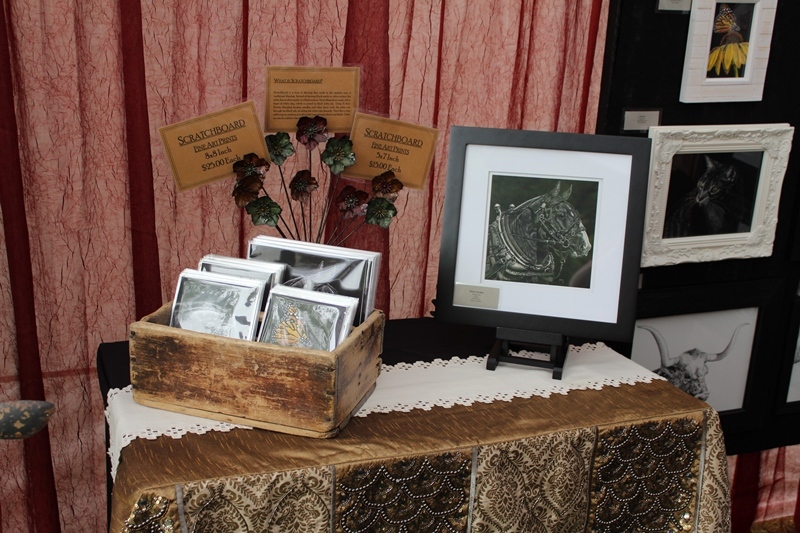 This is my display for my photo notecards, as well as my fine art prints. 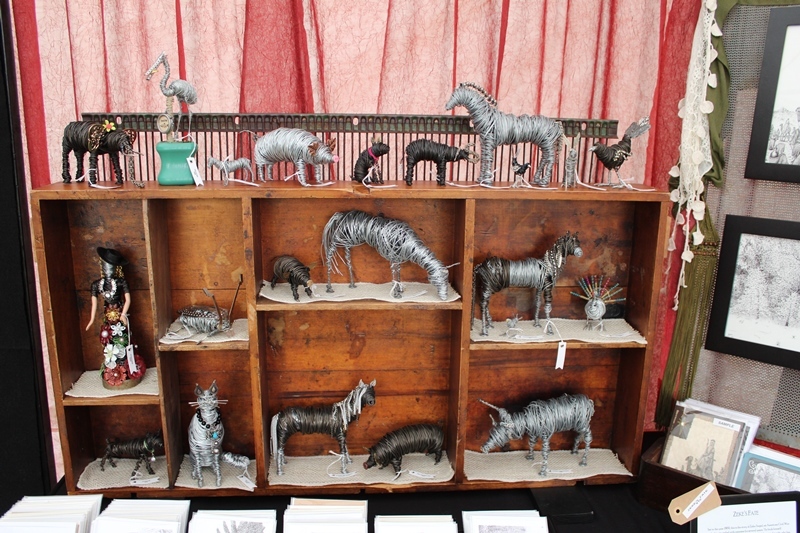 My new sculpture display. Some of these sculptures still need to be posted here on my blog. I’ve fallen behind! My art wall, featuring all animals this time, since my drawings of people got their own feature in the Ancestry Art. I hope you enjoyed this little taste of my art show. I had a great time, and for those of you who visited, I hope you had a great time, too! I was just toying with these pieces one day in my studio, and I held two matched pieces together and suddenly, I saw an insect face and antenna. Immediately, I began to put together different pieces to create the rest of this insect. I took out a box of sewing machine parts I bought for a bargain at a local antique store, and looked through my junk stash until I found the right pieces. This sculpture came together quickly and easily, which was unusual. I typically need a few days to picture the sculpture in my head, and some more time yet to find the right embellishments. But this beetle just came together nicely. – He measures 5 inches long by 4 inches tall by 4 inches wide. He’s low and wide, unlike most of my previous sculptures. Those big, scuttling legs add width. Shockingly, I forgot to post this wire/junk sculpture. I made it quite a while ago, and how I never got around to posting it, I don’t know. When I buy old, broken and discarded jewelry, I often buy big bags-full of it for a good price if I can. It’s much better than buying new “fake old” embellishments at art and craft stores, because you never know what you’ll find in bags bulging with tangled chains, jewelry, and so on. In one of these big bags full of junk jewelry was this large plastic flower pin. It was a bit time-worn, a bit gaudy, and I just didn’t know that I could use a piece like this. As you can see, it found a home. The pin is probably about 2 inches across, and I decided to just let the flower be a flower rather than try to incorporate it into anything else. I used wire to make the stem and leaf, and attached it to a furniture foot base, which I painted a sunny yellow. The addition of the bumblebee came to me after the flower was made, and I wanted him to be one of those chubby, adorable bees that dip in and out of flower gardens all day long. – Made with 17 gauge steel wire, finer craft wire in silver, black, and gold for the bee. I also used a furniture leg/foot for the base, and of course, the bright orange flower pin. As you see, Norman made it into the photo shoot. You may remember the adorable little shoes I purchased earlier this year. They reminded me of one of my characters in a book-in-the-works. Her name is Josephine, and I imagine she wore shoes like these. Painting is always difficult for me. It just doesn’t come to me as naturally as drawing, so I tend to put it aside easily. Still, the bug to paint comes every so often, and then I’ll take out my brushes and give it a go. I’ve found that painting from life is much more educational than using a photograph, so I usually try to use a real object. 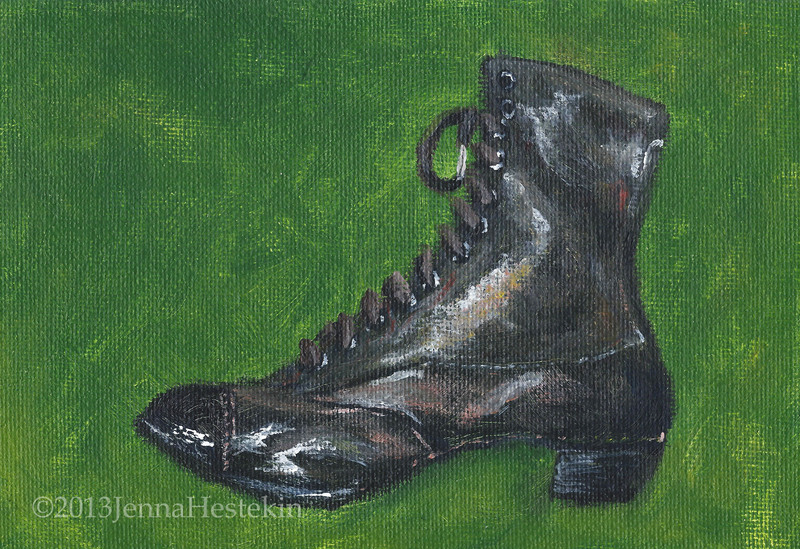 I ended up using one of these fabulous old shoes as a subject, and started in on the painting. I used three basic colors for this, with the addition of white and black for values. It is much less complicated to use a limited palette, and it really helps me to learn more about color mixing. – Painted with Liquitex Acrylic paints. Colors used were Cadmium Yellow Medium Hue, Ultramarine Blue, Naphthol Crimson, Mars Black, and Titanium White. – Brushes used were mostly coarse flat, bright, and round brushes. – 5×7 inches in size, painted on a canvas panel.